Fenugreek, Trigonella foenum-graecum, seeds has had application as a cooking ingredient, and has medicinal properties as well (NCCAM). Fenugreek has also been called Bird’s Foot, Greek Hayseed, Trigonella, Bockshornsame, Methi and Hu Lu Ba. 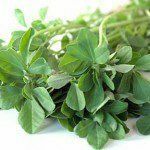 Recent studies have shown Fenugreek might have indications in individuals with Diabetes and High Cholesterol since it lowers blood glucose and cholesterol levels (Sloan-Kettering). Research has demonstrated Fenugreek lowers blood glucose and cholesterol. However, it is still not known how Fenugreek works. Studies suggest fiber in Fenugreek either binds to glucose and cholesterol, preventing our body from absorbing it, or it increases insulin secretion (Sloan Kettering). In a study conducted, individuals with Type I Diabetes who were given Fenugreek over 10 days experienced reduced blood glucose levels, urinary glucose excretion, as well as reductions in total cholesterol, LDL cholesterol, and triglycerides. However, HDL cholesterol did not increase (Sharma, Raghuram, and Rao 301-306). In a separate study conducted, similar results were achieved in individuals with Type 2 Diabetes and Coronary Artery Disease. However, Fenugreek did not improve blood glucose or cholesterol levels in healthy participants (Bordia, Verma, and Srivastava 379-384). Although more research needs to be done, Fenugreek has also been used to Stimulate Lactation in Breast Feeding Mothers. Fenugreek’s side effects include bloating, gas, diarrhea, and when it comes in contact with skin it can cause mild irritation (NCCAM). Fenugreek is contraindicated in women who are pregnant or nursing. Individuals who have Breast Cancer should avoid Fenugreek, as laboratory experiments have shown it increases growth of cancer cells. Also, individuals who are on anticoagulants should not use Fenugreek since it may increase the risk of bleeding (Sloan-Kettering). Bordia, A, SK Verma, and KC Srivastava. “Effect of ginger (Zingiber officinale Rosc.) and fenugreek (Trigonella foenumgraecum L.) on blood lipids, blood sugar and platelet aggregation in patients with coronary artery disease..” Prostaglandins, Leukotrienes, and Essential Fatty Acids. 56.5 (1997): 379-384. Web. 9 Jul. 2012. “Fenugreek.” Memorial Sloan-Kettering Cancer Center. N.p., 6 Jun 2012. Web. 5 Jul 2012. “Fenugreek.” National Center for Complemetary and Alternative Medicine . N.p., Jul 2010. Web. 9 Jul 2012. Sharma, RD, TC Raghuram, and NS Rao. “Effect of fenugreek seeds on blood glucose and serum lipids in type I diabetes..” European Journal of Clinical Nutrition. 44.4 (1990): 301-306. Web. 9 Jul. 2012.